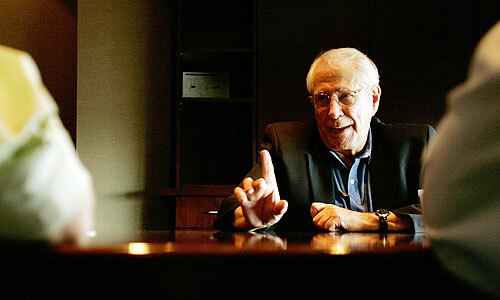 Former Alaska senator and current Democratic presidential hopeful Mike Gravel speaks during an interview at the offices of the Las Vegas Sun on Thursday, September 20, 2007. Gravel's Credentials: Mike Gravel was given the Pentagon Papers at midnight outside the Mayflower Hotel in Washington, D.C., in June 1971. Then a U.S. Senator from Alaska, Gravel had been handed the secret government history of the Vietnam War, which exposed many of the deceptions at the heart of America's conflict in Southeast Asia. Soon after, he risked his career and his freedom by reading the documents into a U.S. Senate subcommittee record, thus making them public. For Gravel, it was the most significant chapter in his life and nearly destroyed him. He left the Senate after losing his bid for re-election in 1980, disgusted with government and politics, and embarked on a business career that failed, not to be heard from again. Gravel has returned to run for president as a voice of anti-war movements past protesting the current war in Iraq and a feared conflict in Iran. It's a voice more powerful in a 90-minute conversation than in the sound bites of televised debates, where he's come across as slightly wild-eyed and eccentric. Regardless, he has had some success reminding the public about the errors of wars past. Place of Birth: Springfield, Mass. Education: B.A.in economics, Columbia University, 1956.
Notable: While attending Columbia University in the 1950s, Gravel was a cab driver in New York. Before becoming a senator in Alaska, he worked as a brakeman for the Alaska railroad. His five-month filibuster was instrumental in the discontinuation of the draft following the Vietnam War. Nevada Contributions: A breakdown of Gravel's financial contributions from the Silver State. State by State Contributions: A breakdown of Gravel's financial contributions across the U.S.
Gravel's MySpace Page: Read Gravel's profile information and leave a message. Gravel's Facebook Page: Read Gravel's profile information and leave a message. Gravel's Flickr Page: View Gravel's photos from the campaign trail. Press Secretary: Alex Colvin and more key people.